CASTRIES, St. Lucia, Aug.9, CMC – A three megawatt solar farm of the St. Lucia Electricity Services Limited (LUCELEC) was officially oepned Thursday by former US President Bill Clinton, Prime Minister Allen Chastanet, and former President Jose Figueres Ferrer of Costa Rica and Board of Trustees for Rocky Mountain Institute (RMI) in the community of Vieux Fort. The utility-scale renewable energy project, the first of its kind in St. Lucia, was made possible through technical assistance from the Rocky Mountain Institute (RMI) which has received financial support from the United Nations Development Programme, the Global Environment Facility, and the Norwegian Agency for Development Cooperation. “Today I applaud those who made this solar park into a reality – LUCELEC and the government – by working together are setting an example for other islands. Collaborating to solve your countries energy future is what we all should be doing,” said Figueres. 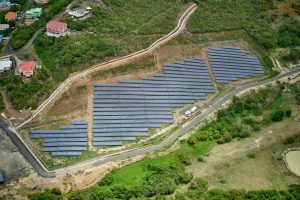 “This solar farm is a major first step for St Lucia, and we can already see that it is paving the way for more renewable energy projects in the years to come,” said Clinton. “I know that this renewable energy project will be a great success and it represents a new promise and a new model that I hope to see replicated in the future,” said Prime Minister Allen Chastanet. Clinton, Chastanet, and Figueres were joined by Governor General Sir Neville Cenac, Energy Minister Stephenson King, and officials from LUCELEC. The solar farm builds on the work LUCELEC has been doing with grid-tied rooftop solar photovoltaic (PV) systems since 2009. The EC$20 million project, located north of Hewanorra International Airport, is funded, owned and operated by LUCELEC. Construction of the solar farm began in November 2017, and the solar farm began feeding the grid in April this year when the entire three MW of alternating current power came online. The solar farm’s nearly 15,000 panels, totaling 3.95 MW direct current installed power, will generate approximately 7 million kWhs (or units) of electricity per year. The solar farm meets about five per cent of St. Lucia’s peak electricity demand and will reduce the volume of fuel purchased by LUCELEC by about 300 thousand imperial gallons per year. LUCELEC uses approximately 20 million imperial gallons of fuel per year. GRUPOTEC, an international firm with extensive, worldwide experience in developing solar plants undertook the engineering, procurement, and construction of the solar farm. Rocky Mountain Institute with global energy and engineering advisory firm DNV GL led project development, and supported bid evaluation and contract negotiations for the project.